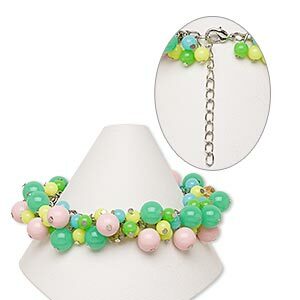 Bracelet, acrylic / glass / silver-finished steel / brass, multicolored, 23mm wide with round, 7 inches with 2-inch extender chain and lobster claw clasp. Sold individually. Item Number: H20-6482JD Have a question about this item? 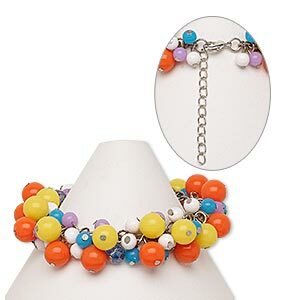 This silver-finished steel bracelet featuring multicolored acrylic and glass and faceted glass round beads adds easy style and a fun and fashionable look to any outfit. Ready-to-wear jewelry makes great gifts and counter displays. 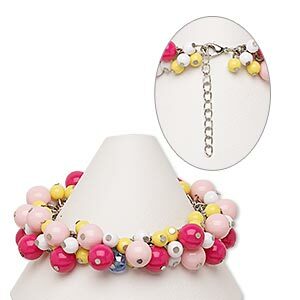 Colors can include yellow, pink, white and more. Colors, shapes and sizes may vary in each lot. 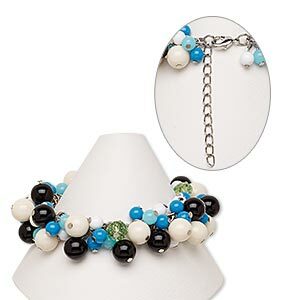 Bracelet, acrylic / glass / silver-finished steel / brass, multicolored, 22mm wide with round, 7 inches with 2-inch extender chain and lobster claw clasp. Sold individually. 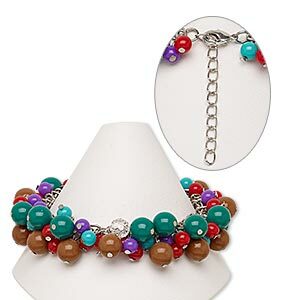 Bracelet, acrylic / glass / silver-finished steel / brass, multicolored, 20mm wide with round, 7 inches with 2-inch extender chain and lobster claw clasp. Sold individually. Bracelet, acrylic / glass / silver-finished steel / brass, multicolored, 24mm wide, 7-1/2 inches with 2-inch extender chain and lobster claw clasp. Sold individually. 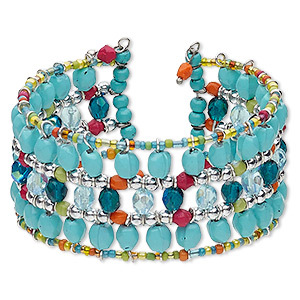 Bracelet, cuff, glass / painted acrylic / silver-plated steel, multicolored, 34mm wide, adjustable from 7-1/2 to 8-1/2 inches. Sold individually. 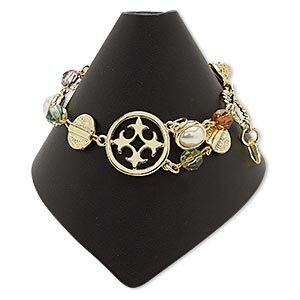 Bracelet, glass / acrylic / gold-finished steel / copper / "pewter" (zinc-based alloy), multicolored, 23mm wide, 6-1/2 inches with 3-inch extender chain and lobster claw clasp. Sold individually. 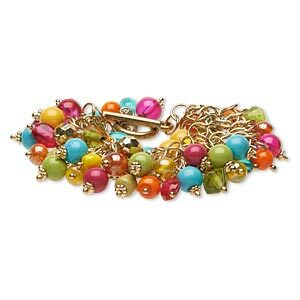 Bracelet, glass / gold-coated plastic / gold-finished steel, multicolored, 25mm wide, 7-1/2 inches with toggle clasp. Sold individually. 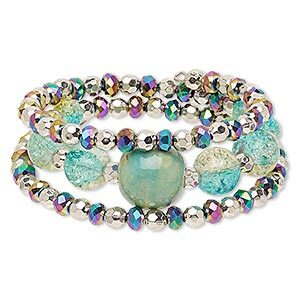 Bracelet, acrylic / glass / steel memory wire / silver-coated plastic, multicolored, 30mm wide with round, adjustable from 7-1/2 to 9 inches. Sold individually. 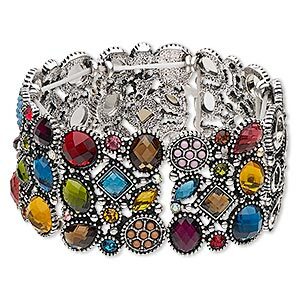 Bracelet, stretch, acrylic / glass rhinestone / antique silver-finished "pewter" (zinc-based alloy), multicolored, 35.5mm wide with multi-shape design, 6-1/2 inches. Sold individually.